Come across a cop? Introduce yourself, ask how you can pray for him or her and…pray! We all know a bull rider or cowboy or two that have got themselves on the wrong side of the law. Stereotypes exist for a reason but we also know that you can’t assume that everyone belongs to the stereotype. Bull riders and rodeo cowboys aren’t always running wild and getting into bar fights and cops aren’t always shooting innocent people. So here’s how we can make a difference in some small and bigger ways to the pressures police are facing right now as they are targeted for attacks and facing abuse for the poor decisions of some, the mistakes of others and jumping-to-conclusions of other situations. We can also show Christ to them in the process. 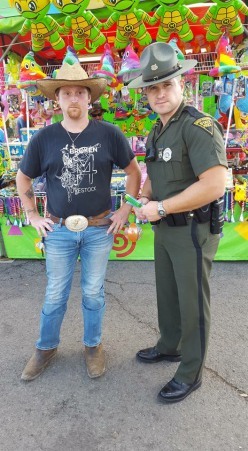 When we see them in your travels or especially at the arena or fairgrounds you’re at, have your pictures taken with the officer (or a ‘selfie’) and head to Snapchat, Twitter and Facebook where you can share it with the hashtag #CowboysforCops. Tell them that even when we don’t always see eye to eye, we’re glad they’re out there. Be encouraging and ask them how you can prayer for the, the most important part of this. I know praying is intimidating for a lot of people but if we truly believe what we say we believe, then we believe praying for one another is important. There is no shortage of examples of the importance of prayer through the Old and New Testament. Yet many of us struggle with how to do it and it can take awhile to get comfortable praying in front of others. In the book of Acts, we see the early church forming and praying together was part of that foundation. Then, when James was executed and Paul was imprisoned to face death as well for preaching about Jesus, we see this in Acts 12:5 So Peter was kept in prison, but the church was earnestly praying to God for him. Earnestly means with great effort. And an angel was sent to rescue Peter from prison. So let’s find the courage to pray with those officers as we encounter them. If you’re uncomfortable praying on the spot, assure them you’re praying and really do take care of it on your own time. But we encourage you to try to pray with them at the time as well. It will be the most encouraging to them and in the process, we can get more comfortable praying for one another. * Don’t be afraid to ask if you can pray for an officer or group of offices. Even if everyone feels awkward, most are going to agree to it and be encouraged by it. * Ask the officers how you can pray for them. Some will share with you a specific need. * Remember, God wants us to pray. Prayer is how we communicate with God. The Lord’s Prayer found in Matthew tells us to pray which includes recognition of who God is (our Father and the holiest of all) ,to seek God’s will and to present our needs. In this case, we acknowledge everything will work for God’s purpose but we can tell God of our appreciation for these men and women who protect us (not just arrest us) and ask that He keep them safe, keep them encouraged and keep them strengthened. * If you’re a cowboy comfortable praying, please gather with a few of the guys and be the one to lead it with the police who are around. ***IMPORTANT PLEASE send the photos to use and we will put them up to the website. Also! Send the officers to www.cowboysforcops.com so they can see the photos and be encouraged by them.